Jesse I and Troublemekka present a night of bruk out Jamaican dancehall, bashment and jump up soca at the Laundry Bar. Running bi-monthly, Yard Bounce aims to feature the finest selectors, MCs and dancers in the business. Get ready for the vibes to tun up Caribbean-style this summer! The second instalment will feature hosts Jesse I and Troublemekka alongside guest DJs Rebel Bass (NZ), Sista Sara, and DJ Sam; plus live performances from Di Apprentice and Bahdoesa (Quashani Bahd and Muma Doesa). 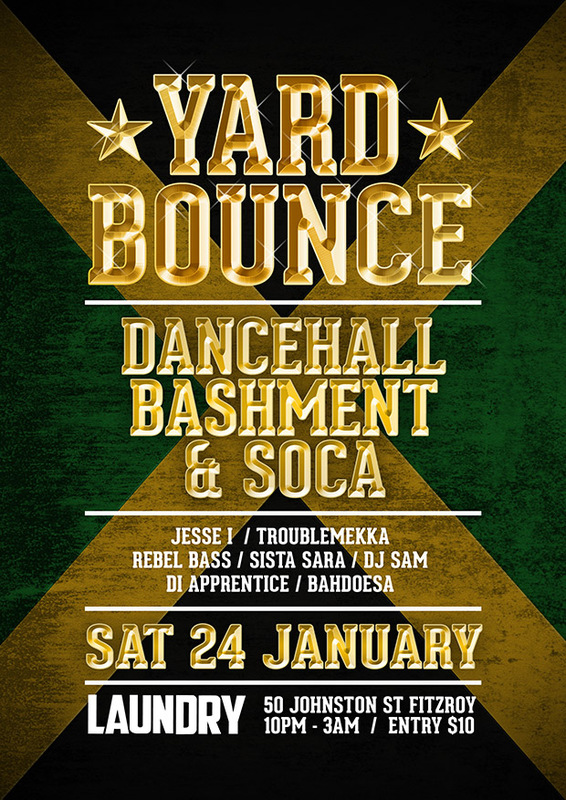 Yard Bounce takes place on Saturday 24th January at Laundry (50 Johnston St, Fitzroy). $10 door pressure. 10pm-3am.